Just like conservatories, there are many orangery designs you can take advantage of to transform your home, making the most of light and space. This means you can set your home apart from others and make the most from an installation. 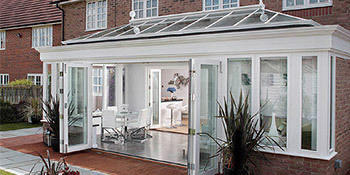 Orangeries are growing in popularity and tend to be larger than conservatories. They bring a fantastic modern look to properties and will add value to your home. Another benefit to an orangery is that they’re often granted planning permission for listed buildings and homes in Conservation Areas. This is something conservatories typically struggle with. An orangery will provide a warm and elegant feel, adding a real sense of quality to your home. Wood in particular is a popular material choice for orangeries, but other options such as aluminium and uPVC are just as viable. Orangeries are a stylish alternative when it comes to extending your home, and offer a place that can be relaxed in all year round. With superb energy efficiency qualities you’ll be able to make the most from great insulation and keep warm even in the winter months. Orangeries have a similar appearance to conservatories but offer homeowners something different in the improvement of their property. For something that adds class and style to your home, orangeries are top of the food chain. Comparing orangery prices is crucial to ensuring you don’t pay over the odds and have something to be proud of. For up to four FREE orangery quotes, simply complete our quick form and hear from up to four local, vetted and reputable companies. Pleasant and helpful manner. But we have decided to cancel the project for the time being. Only contacted by two companies. Very impressed with both. Properties are given an energy rating based on how efficient they are and ratings are presented in the data beneath. This varies from A, the most energy efficient, to G, the very least efficient. With a higher rating you're more likely to have more affordable energy bills as more heat shall be retained inside your home. You can boost your home's efficiency with insulation including double glazing, loft lagging or wall cavity insulation. The information below indicates the several types of properties within Uk. By far the most common properties throughout the UK are detached and semi-detached homes. Other kinds of houses consist of terraced houses, flats, converted flats and bungalows. The pie chart below reveals the percentage of homes in Uk which are central heated and non-central heated. Central heating figures within the majority of UK houses, which includes those on the gas grid and homes heated by oil and electric. The data beneath illustrates the spread of properties heated by different fuels. Around the United Kingdom the most frequent hands down are gas heated houses, followed by electricity and then oil. Biomass central heating boilers are also growing in popularity, heated by green products including wood pellets or agricultural waste.|Homes in the UK are heated by a variety of fuels, including gas, electricity, oil, solid fuel and LPG boilers. Each fuel has a varying cost associated with it which means you may find yourself with less expensive energy bills by altering the way your house is heated. Even solar thermal panels are being considered by many in order to lower heating bills for the many years to come.